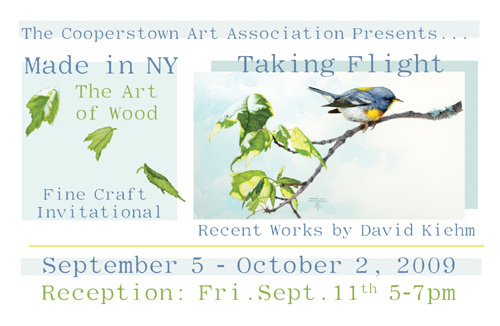 This is an promotional exhibition flyer for two exhibits at the Cooperstown Art Association: Made in New York: Fine Craft Invitational & a solo show by David Kiehm. I started working with only samples of the artist's work and titles, and was responsible for developing the visual concept for the overall card as well as adhering to bulk mailing guidelines. My goal was to combine themes and artwork from these various shows and reach a cohesive, elegant arrangement. I also applied this design to create emails, ads, website graphics, signage & social media promotion.